These are interesting times for Bragi, the young startup making waves in the world of hearables. Bragi calls the Dash Pro, the earbuds it launched last year, an "ear computer". Certainly, between live translation (it was there before the Pixel Buds were), heart rate tracking and some innovative – if uneven – gesture controls, it's hard to dispute Bragi's claim. Next, it wants to build something for people who need it the most. At CES 2018, Bragi announced something it calls Project Ears. This is a new health-based challenge to build custom audio technology that will help people with hearing impairments. To that end Bragi has partnered with Mimi Technologies, creator of a sound processing tech that personalises audio to the individual. Bragi wants to make a hearing aid-like device, but CEO Nikolaj Hviid said he also wants to create an FDA-approved hearable that can offer tinnitus relief. Bragi has a big opportunity here: a bill to deregulate the sale of hearing aids was passed last year and is currently being digested by the FDA as it decides how it will maintain a level of quality across hearing-assistive devices soon to be sold over the counter. It sounds like Bragi is going to bring this tech to market in a device similar to the Dash Pro, though it's not yet saying for certain. 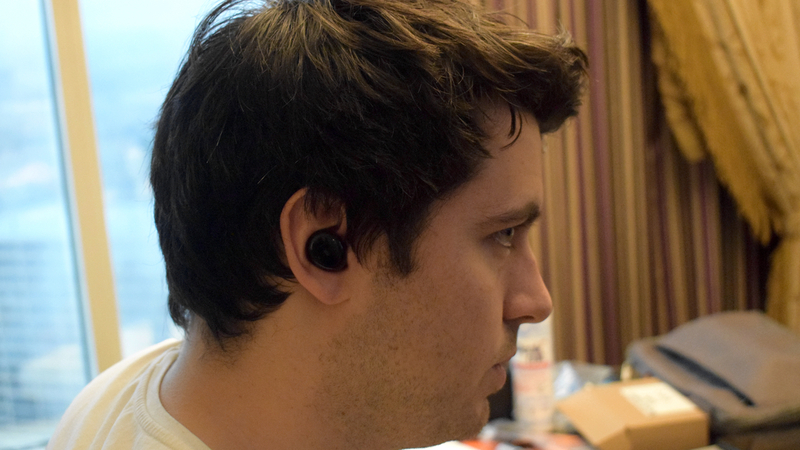 But in a hotel room in Las Vegas for CES 2018, I got to try an early prototype of Project Ears, which created what Bragi calls an "earprint" – Silicon Valley speak for pure-tone audiometry, the process of measuring your hearing sensitivity. Project Ears evaluated my hearing capabilities on three different frequency levels. Each was played in turn on each earbud, getting progressively louder, and the Bragi assistant ordered me to tap the side of the earbud as soon as I could hear each one. "Every ear is unique" she informed me as her voice moved from right ear to left to start the process over again. This process tunes the Dash earbuds to your personal hearing profile. Quite simply, frequencies that need enhancing will be enhanced, and the ones that don't, won't. Once the setup was done the audio passthrough automatically switched on, and I was hearing the world with new clarity. "The idea is to make it user friendly and make it work for people who are not tech geeks," Darko Dragicevic, executive VP, partners and solutions, at Bragi told me. "It needs to be very straightforward and simple." I should point out at this point that I don't have any notable hearing impairments, so I'm not really Project Ears's target market (though there could be applications beyond health here), but I was still hearing the world differently. I got up and paced across the room, and as I did small sounds like my foot hitting the carpet, or my hand fumbling with the hem of my shirt, were amplified. Bragi hadn't just made everything louder, but had retuned how I heard the world around me, similar to how a hearing aid would be specifically tailored to your ears. Once I was stood on the other side of the room, Dragicevic played some music from the speaker on his phone which was now far more pronounced with the Dash Pro in my ears. CES 2018: Can the controversial wearable work better? Now, had I walked out of the room, exited the building and wandered down the street, it wouldn't have been a pleasant experience. The amplification would stay the same, blasting car horns and God knows what else at my eardrums. But the end game, says Dragicevic, is for the earbuds to adjust to your environment automatically. Doppler Labs was working on something similar before its demise with the Doppler Here One, which could alter your audio filter depending on where you are. Doppler also had ambitions to take advantage of the Over The Counter Hearing Aid Act, a bill it actually helped push through. Hearing aids are expensive, ranging from $1,000 up to $4,000, and given to patients via a health care professional. Bragi could offer something at the lowest end of that spectrum, perhaps even lower, bringing the same level of hearing assistance in a product you can pick up in a Best Buy. One thing that seems certain though is that, should Bragi make this a standalone device, it would need to gut the Dash Pro of its other smart features to ensure battery life is optimised. Bragi says we can expect to see the fruit of its labour later this year. Whether that manifests in an actual product or just a software update to the existing Dash devices remains to be seen. I have a lot of faith in Bragi having owned Dash earbuds since the early days. These sound promising and having reached an age where I often turn the TV subtitles on so I don't miss any dialogue, I am a likely prospect. It would be good if they can be self calibrated by following a set of directions with test audio on line, and if they double up for audio playback as the usual Dash Pro earbuds, then their target market will really have something to look forward to.